Macabre Mansion Presents... 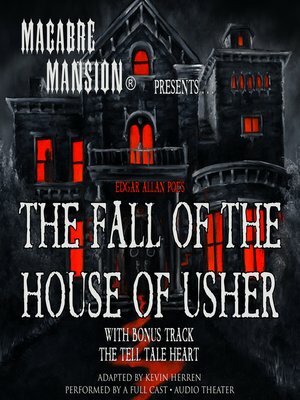 The Fall of the House of Usher is an audio drama adaptation of the Edgar Allan Poe's classic short story. This adaptation stays true to Poe's original vision with only minor changes in dialogue. Driven to the edge of insanity, Roderick Usher believes unknown forces torture his every moment. In a final attempt at finding a moment's peace, he begs his childhood friend to come to his aid. Upon arriving, Roderick's friend discovers all is not what it seems in the macabre House of Usher. This audio production features a star-studded cast that includes Kevin Sorbo as the narrator, Jim O'Rear as Roderick Usher, Bonita Friedericy as Madeline Usher, and John Billingsley as the doctor. Edgar Allan Poe (1809-1848) transformed the American literary landscape with his innovations in the short story genre and his haunting lyrical poetry, and he is credited with inventing American gothic horror and detective fiction.